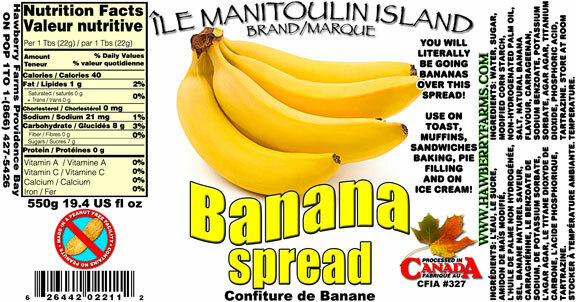 Click the button below to add the Banana Spread - Large - 500ml Jar to your wish list. You will literally be going Bananas over this spread! Completely different then jam, this light and fluffy almost dessert-like topping can be used on toast, muffins, sandwiches, baking, pie filling and on ice cream! Water, sugar, modified corn starch, non-hydrogenated palm oil, salt, natural banana flavour, carrageenan, sodium benzoate, potassium sorbate, agar agar, titanium dioxide, phosphoric acid, tartrazine. Store at room temperature. Just tried this at the Kingston Home Show. This was truly amazing. Wow is all I can say!